When considering an outdoor living space addition, a little planning can go a long way! Most big decisions are accompanied by a big investment, and as such, proper planning goes a long way in giving you confidence in your choices. As a homeowner, this rings especially true with renovations or additions to your home and its environment. When choosing to add or enhance an outdoor living space, many factors are considered during the planning stage to make sure it meets your needs as well as blends into the architectural style and layout of your home and property. We here at Archadeck of Central South Carolina use our planning and design process with a single goal in mind…designing and building custom outdoor living spaces to bring enjoyment and pride for many years to come! To assist in the preliminary phase, Archadeck has created a simple yet valuable tool to help homeowners ignite their imaginations and define their preferences and function needs for the perfect outdoor living space. 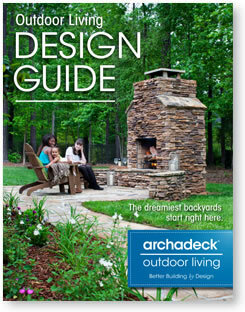 It is called the Archadeck Outdoor Living Design Guide, and you can download it free by visiting the Archadeck of Central SC website. Three basic pieces of information form the foundation of a successful project: the function, type and style of outdoor living space addition or renovation you have in mind, the anticipated completion date desired and your estimated budget goal for the project. It has been our experience, having this information organized and in hand not only helps you clarify your outdoor living space needs and wants, but it also helps our team to better translate your desired goal into a finished project. For what activities will this space be used? The best outdoor living structures are designed with perfect union of form and function. Do you wish to have a technology-free zone, just right for rest and relaxation? Or will your space need an outdoor kitchen area to be used for family barbecues and larger dinner parties? Do you want an open, exposed area where you can bask in the sun, or do you prefer a covered area with protection from the elements? Better yet, how about a combination space for all of the above? What is the contour of your property? Is it flat or does it have slopes? The contour must be taken into consideration when selecting the structure and type of outdoor living space, but it doesn’t necessarily limit your options. Additional aspects we consider when creating your custom space are the situation of your property in regard to sun exposure, favorite views you may have and the proximity of neighboring properties…all of which should be kept in mind when selecting the style and design of your sunroom, porch, pergola, deck or combination. Now is the perfect time to plan your backyard retreat, so it can be ready for you to enjoy when the weather gets warm. Having a clear understanding of your tastes and design choices helps you receive the perfect outdoor living environment. That’s where our FREE Design Guide comes in handy. When considering an outdoor room addition such as a screened porch, choosing the best fit for your home’s architecture, your desired function and your budget is important. 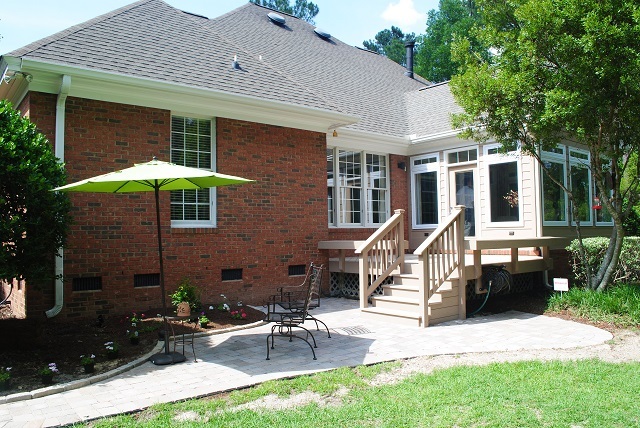 Archadeck of Central South Carolina is the premier outdoor structure builder serving Columbia, SC, and the surrounding area. We can help you choose the perfect custom outdoor living space addition for you with our expert design team and experience in building. Contact us to learn more by calling (803) 603-2160 or via email at centralsc@archadeck.net. We specialize in making your outdoor living dreams come true! This entry was posted in Custom Outdoor Living Designer & Builder, Customized Design, Deck design, Outdoor living space design and building, Outdoor Rooms, Porches and tagged Archadeck of Central SC, Archadeck of Central South Carolina, Archadeck Outdoor Living Design Guide, Central SC deck builder, Central SC outdoor rooms, Central SC porch builder, Columbia SC outdoor living, Columbia SC outdoor structure planning, Finding the right outdoor living contractor in Central SC, Importance of planning your outdoor living space addition, Making your Columbia SC dream backyard a reality on March 5, 2015 by archadeckofcentralsc.